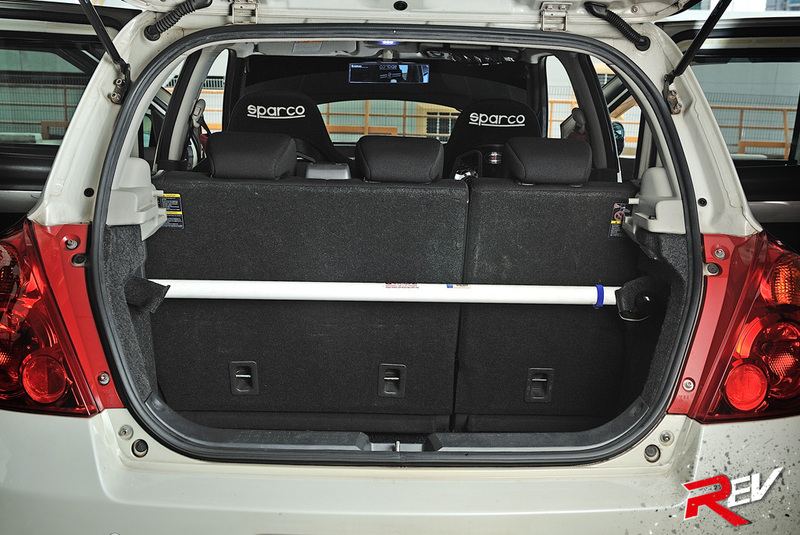 Regenerating interest once again in a slowing hot hatch market, the 21st century unveiled favourite hatchbacks such as the Mini, the Toyota Yaris and the Honda Fit.Ask around, there is not one soul that has never heard of Suzuki’s bestselling hatchback. 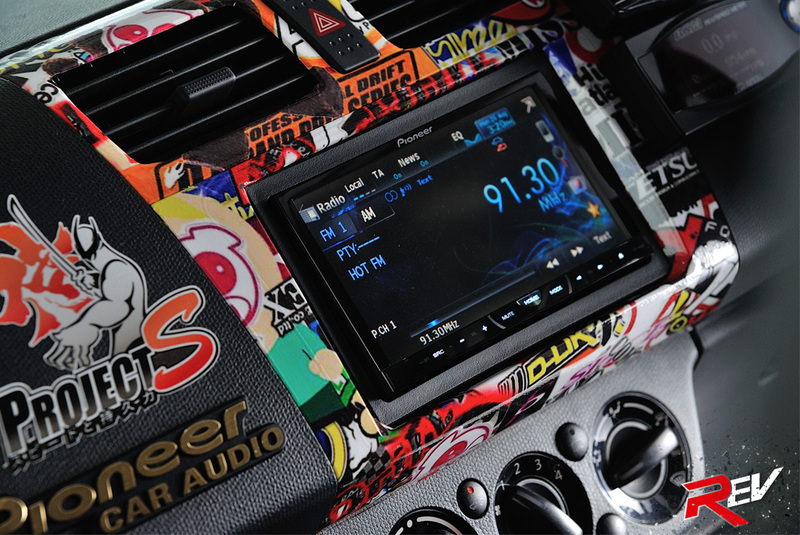 It has chalked up so many wins in Junior World Rally Championships all over the world that it makes it a dizzying spell to read its accomplishments, including gymkhana stages. 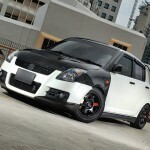 The Swift has stood up against the tests of time and performed well against its other rival hatchbacks. 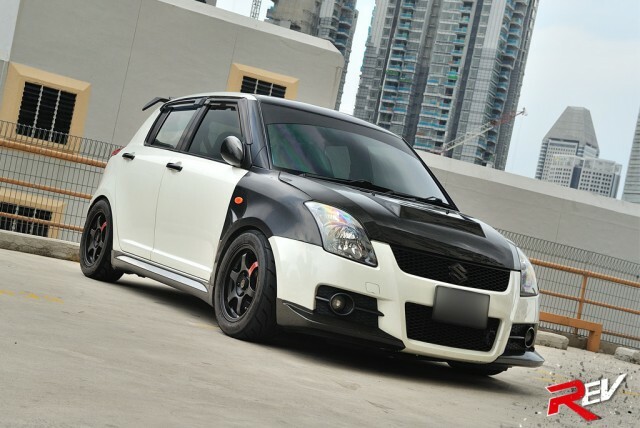 From the early its early days when it was known also as the Ignis or Cultus, the followings throughout the globe continue to swell.With car ownership prices and pump prices at an all-time high here in Singapore, it is not surprising to see potential, car owners settling for Category A cars (below 1600cc in COE context). 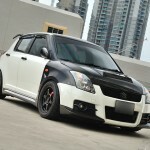 The Suzuki Swift Sport fits this bill perfectly. Pumping a healthy 126bhp from its 1.6 litre, naturally aspirated engine, the light and agile sport variant of the Swift is one tough nut to crack. 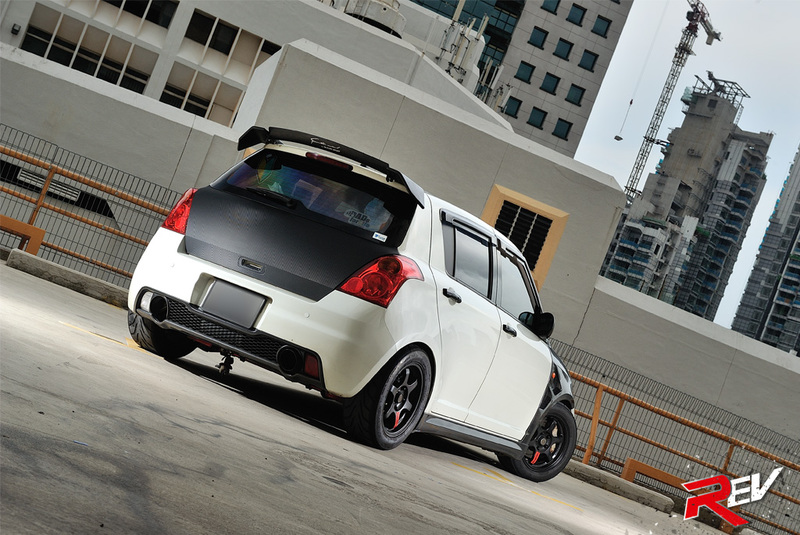 REV Magazine Singapore’s chosen Swift Sport to feature is Jaster’s; whose hot Suzuki hatch caught our eye with more than just its contrasting exterior. Read on, as we explore beneath the facade of glossy carbon fibre… Not originally intended as his very first set of wheels, Jaster had originally wanted a Honda Civic EK4. However, the oddities of the queer COE system had left him helplessly flustered. Opting for an easier solution, Jaster actively searched for a Suzuki Swift Sport, after hearing about its comparatively sporty capabilities. 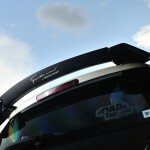 The expectations of a chirpy, revving hot hatch that had a great exterior to boot matched all that he dreamt of. 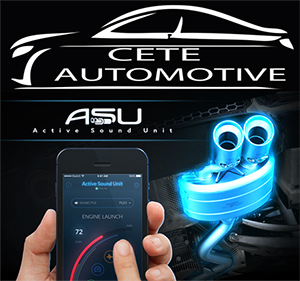 Knowing the limitations of a 1,600cc naturally aspirated machine, Jaster plan of attack was to focus lightly on performance tuning, while stepping the game up on the handling department. 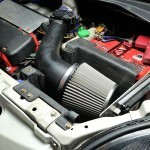 The sector governing the engine has been carefully and cleverly crafted. 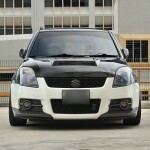 Giving the Swift Sport a better capacity to breath comes through a sweet combination of a Project S big tummy air intake kit, a specially customised funnel throttle chamber and a RRP big throttle kit, while the tail end gets the legal, happy and lively single piped Sunline Racing 60RRS exhaust. 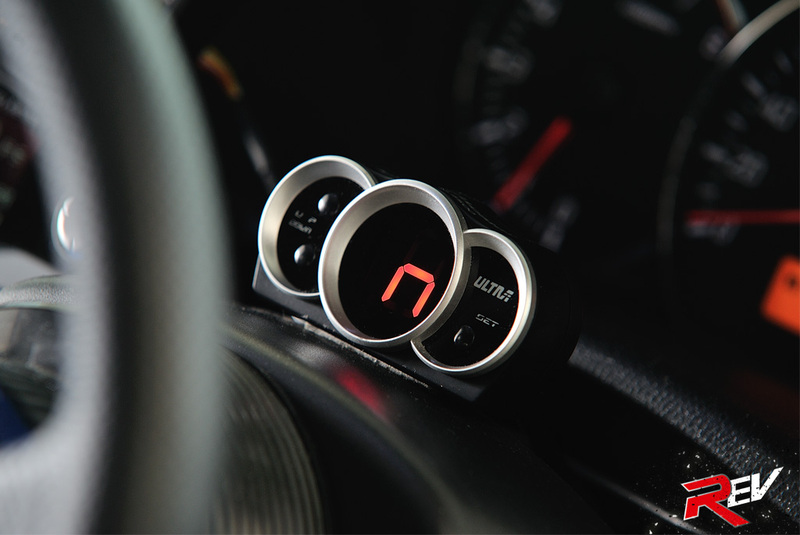 The perfect harmony of air and spent exhaust is balanced with an R’s Racing Parts’ Super ROM ECU that gives the stock M16A engine an additional stable of horses. 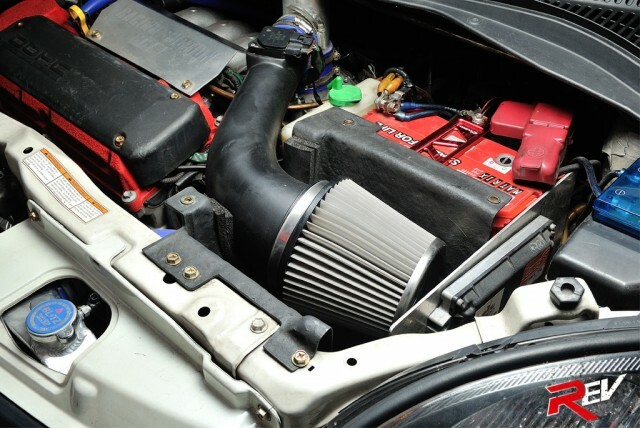 Containing rising temperatures within is a wide variety of cooling equipment, such as an RRP thermostat, an enlarged Blitz radiator linked with Samco silicon hoses to chill steamy issues, as engine oil is kept slick and viscous with a Trust GReddy oil cooler. Powertrain issues were rectified for long-term track use; The 5-speeder manual transmission gets properly spaced torque with a Project S 4.9 Final Drive, alongside a premium combination of RRP’s Reinforced Release Shaft, Lightened Flywheel keep the power connected through all RPM ranges without significant shift loss. 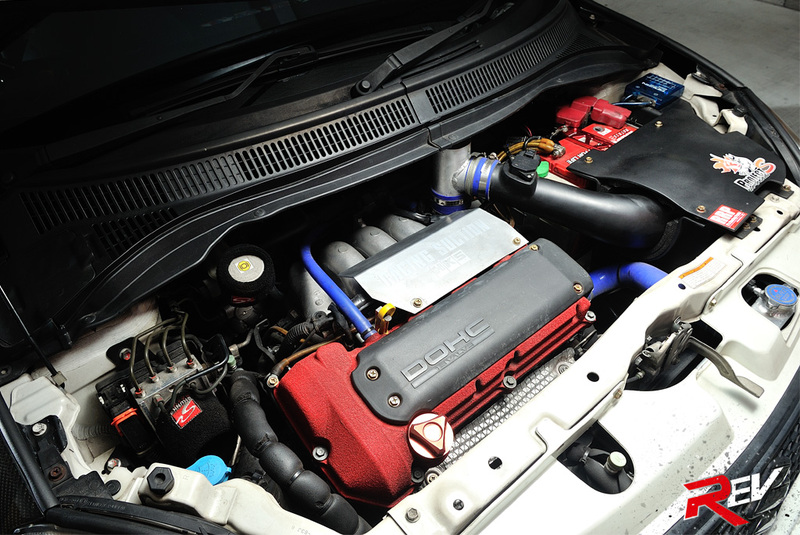 A RRP Carbon Hybrid LSD was also installed to give the Swift Sport a proper advantage during cornering work. Clutch operation failure was timely prevented, with the cheap plastic clutch pushrod making way for a stainless steel metallic one from Project S.
Handling is one of the very true virtues of the Swift Sport, as it gets upped many more notches with another premium RRP product; the High Performance Damper Kit II with incredulous spring rates that hold the hatch steady as it zips through the corners. 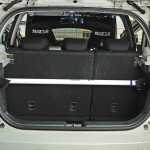 Increasing the rate of quick turn-ins is done with the RRP AngleUp Kit Type II. A plethora of Project S’s chassis strengthening and anti-roll bars were bolted on; from fender bars, to front and rear anti-rolls and struts from Cusco and Ultra Racing. The garage’s rigid collar kits were also installed, keeping the sub-frame aligned with the main chassis, alongside in-house Roll Centre Adjusters that keep suspension geometry bang-on. Extreme footwork is derived from ultra-sticky Toyo Proxes R888 tyres, worn over familiar 15” 6-spoked racing rims, while stopping power is provided by a Project S big brake kit, wearing ACRE Fighter high temperature brake pads. 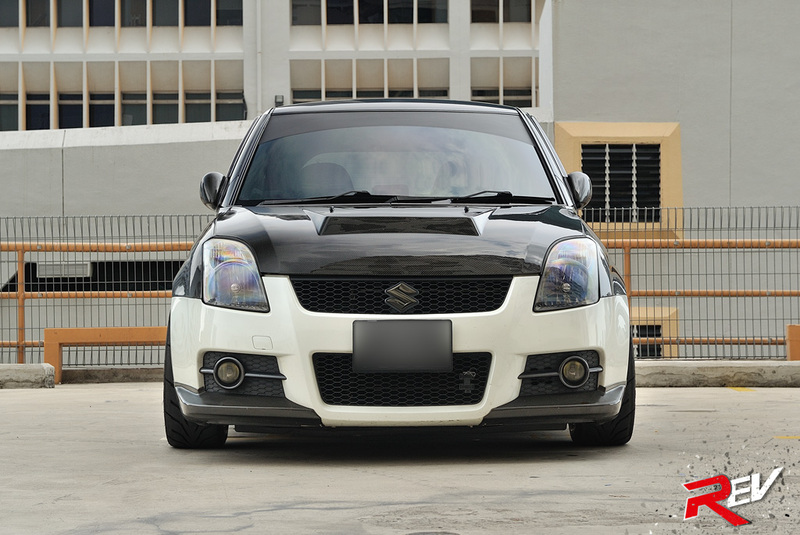 The two-tone outlook of the Swift Sport is largely evident on its front; with a lightweight HKS Kansai carbon bonnet and lip, matching Chargespeed carbon fenders and BeFree carbon aerodynamic side-mirrors to complete the contrast. 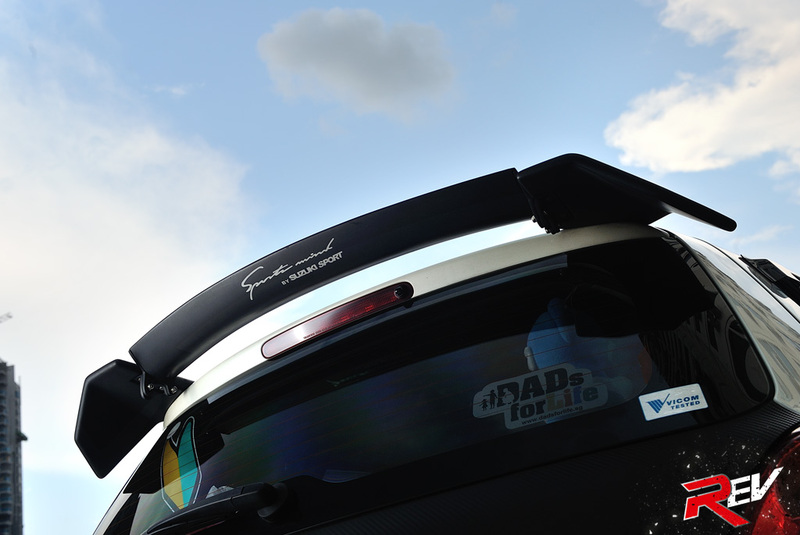 Giving the rear a little planting is Project S’s adjustable rear spoiler. 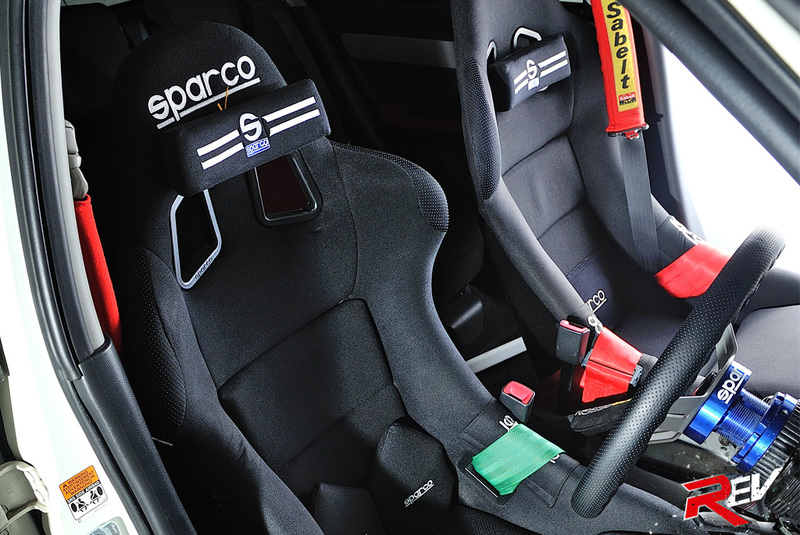 The interior is a playground for both the driver and passenger, as both are firmly held in Sparco Rev full bucket seats, complete with a Takata and Sabelt harness for driver and passenger respectively. 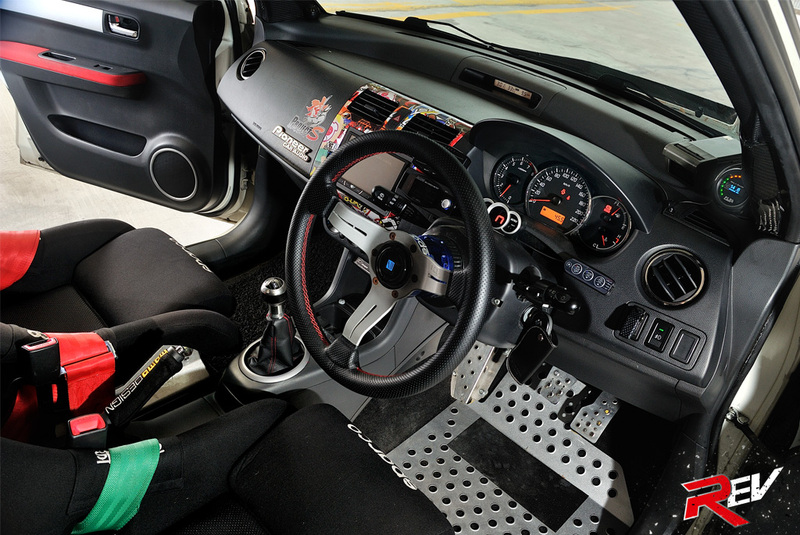 The driver’s steering input is fed through a Nardi Torino deepdished steering, while shift work is done via a Sparco gear knob. 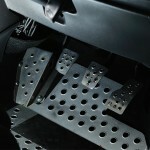 Firm pedal control is an all-essential, with the Okuyama-Carbing pedal set and driver footrest. 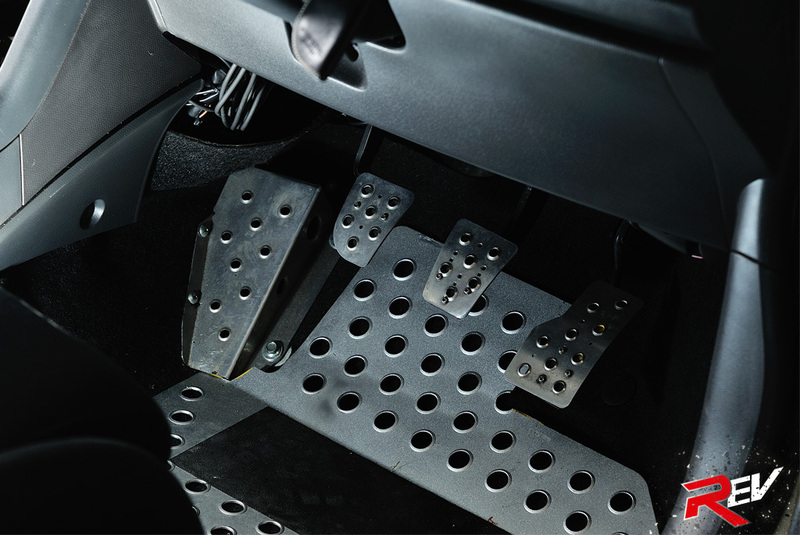 Project S’s items once again fill the interior; from a floor plate to a shifter extender kit. 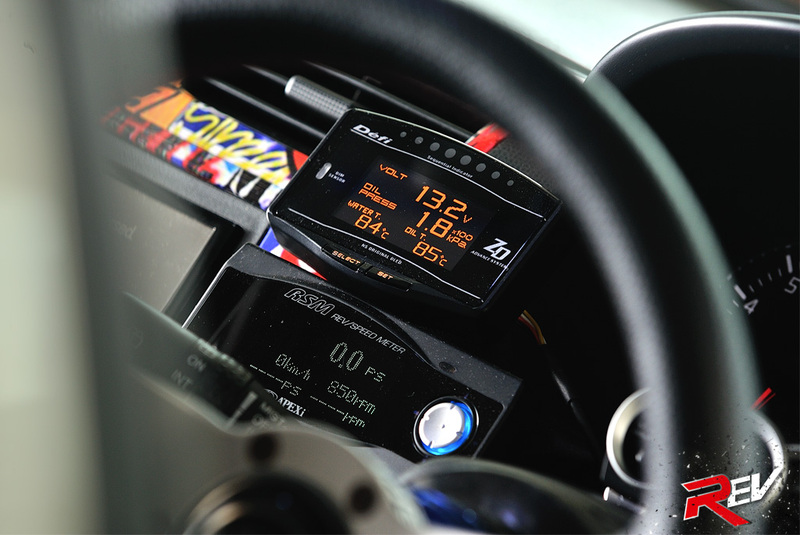 Digital outputs are read via Defi’s Advance ZD display that allows the driver to monitor rev, pressure, temperature and voltage alongside an Apexi RSM. 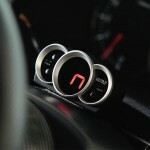 Mounted square on the steering column is a ULTRA shift indicator and on the right, a PLX A/F Ratio meter. 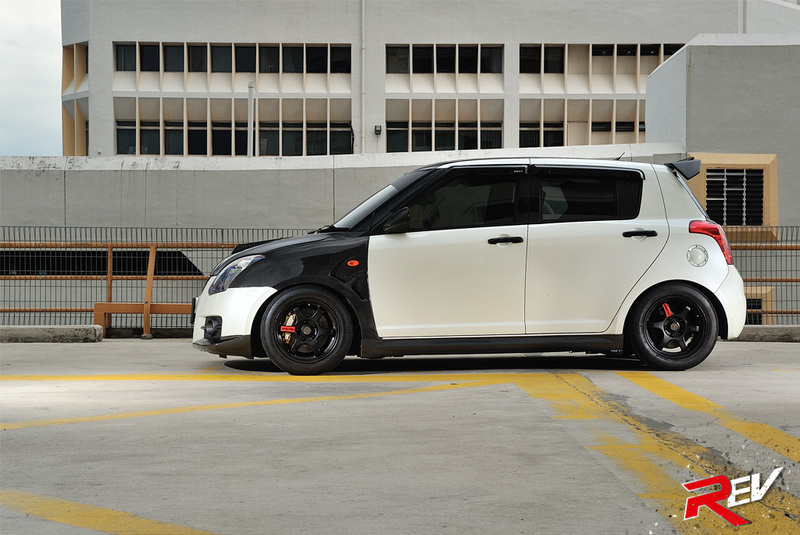 With a couple of trackdays already to Jaster’s belt, the Swift Sport is slowly becoming the proven hatchback of today that can take on the torturing and demanding track conditions of Sepang International Circuit with impressive handling, decent power. There’s no next favourite for Jaster right now, as he plans to keep his carbon menace track-worthy, with more plans that will unveiled in due course to reduce those lap times. 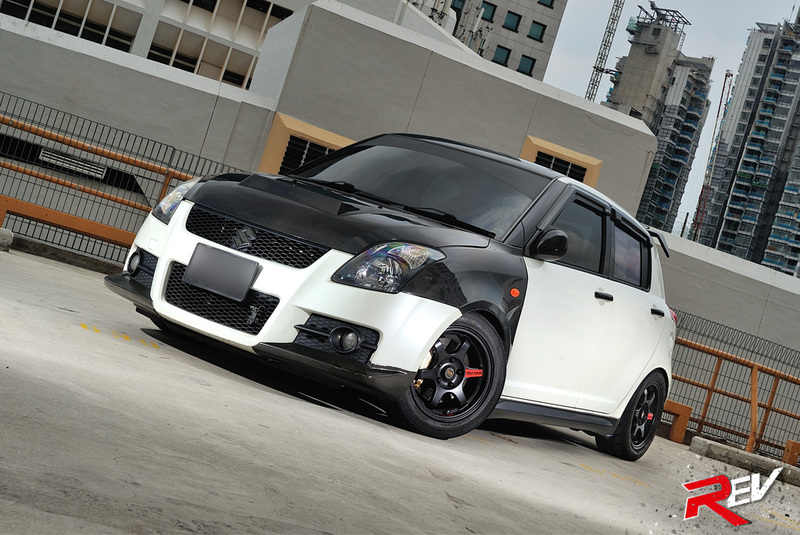 REV Magazine Singapore sincerely wishes Jaster and his Swift Sport the best in their future endeavours!